Most counties will probably have at least two exchange insurers in 2018. Counties in which no insurer has agreed to enter the health insurance marketplace for 2018, or so called “bare counties,” attract attention because they potentially represent the failure of a market to deliver a minimum of services to consumers. In that way they provide a kind of referendum on the ability of local markets to withstand structural weakness, state policy decisions, and the current climate of federal uncertainty. At the time of this writing, approximately 40 counties in three states—Indiana, Ohio and Nevada—have no committed insurer to sell exchange plans in 2018. This number will fluctuate as the season progresses. It may grow as insurers announce further exits, which could happen as late as September. It may shrink as state regulators cajole carriers to cover bare areas, which has already happened in a number of states. There has also been a small but important amount of bona fide expansion. While bare counties may be interesting to market-watchers, they are enormous problems for states, and regulators will do everything they can to fill them. The most likely outcome is that bare counties will be covered by the time open enrollment begins. The focus on bare counties makes it easy to lose sight of the overall trend in insurer participation. There is no question that the pattern is shifting for 2018. Based on preliminary data and assuming bare counties are filled, these are the kind of changes we might expect. The share of U.S. counties with one insurer will probably increase from about one-third to closer to 45 percent. In terms of people, while close to 20 percent of the population live in a county with one insurer now, it may be closer to 25 percent next year. 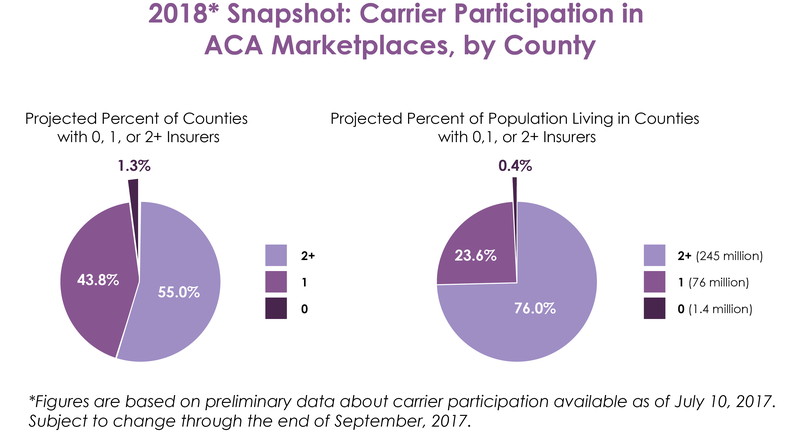 While almost a third of counties (31%) have three or more insurers now, that is projected to be more like 25 percent in 2018. The share of people living in counties with three or more insurers is projected to drop from about 60 percent to a little more than half next year. Reasonable people can disagree about the magnitude of these changes. On the one hand, the percent of counties with only one exchange insurer is projected to increase by about one-third. On the other hand, more than three quarters of the population will probably still live in a county with two or more insurers in 2018. But regardless of what one might think about the size of the shift, there is an interesting aspect to the nature of the change. In 2018, the role of national commercial insurers in the individual market will be truly negligible. Of the more than 700 county-level exits announced thus far this year, more than 65 percent came from national commercial carriers. Humana and Aetna have completely exited the exchanges, and United is virtually gone. Cigna will likely remain in a small number of states. Anthem, which functions as a blue plan, has also significantly pruned its participation in a number of states. At this writing, national commercial insurers (excluding Anthem) comprise less than 2 percent of county offerings. This continues but sharply accelerates a trend which began in earnest in 2015. Even that high point marked a notable decline from 2013. It appears thus far that, at least comparatively speaking, the ACA individual marketplace has not been a favorable environment for this group of insurers. Although some have maintained token footholds in various states—suggesting that they would like to be ready to re-enter were conditions to improve—their role will be minimal in 2018. Due to their importance in the industry writ large, these companies are still considered important stakeholders in current policy debate, despite the fact that they are really not market participants in any meaningful sense. Meanwhile, over the last few years, the participation of provider sponsored plans, regional plans, Medicaid managed care organizations—and most importantly the blues—has steadily increased, and they are the dominant issuers in the market right now. These companies are far more likely to be locally based, which generally raises the threshold for exit, and thereby requires a greater commitment to the population at hand. It seems that for some this commitment has paid off, since financial performance for many has improved in 2017. Both friends and foes of the ACA will continue to monitor insurer participation in the months ahead, and the future is far from certain. Yet the charge that the market is “dead” does not stick. 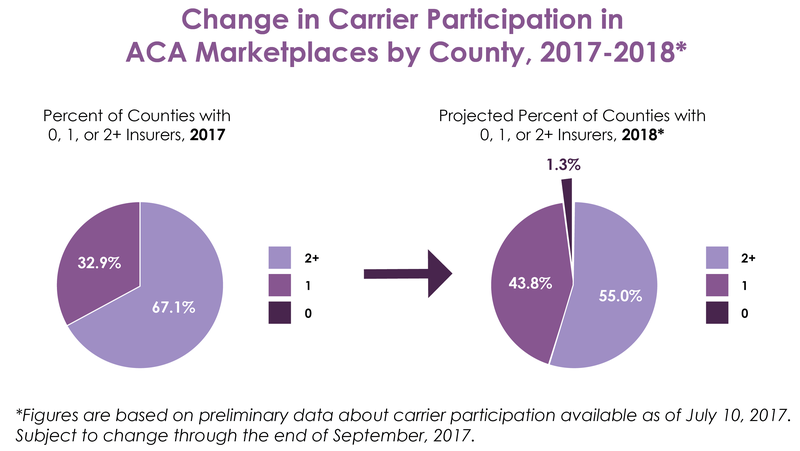 The data thus far suggest that most counties will have at least two insurers offering plans on the exchange, and most people will be able to choose from at least three.